Vickers "K" guns of Short Sunderland W3986/U from Royal Australian Air Force 10 Squadron spray U-71 with .303 caliber (.77 mm) fire on June 5, 1942. U-71 is attempting to bring the stern level with the bow as machine gun fire is concentrated on her conning tower. U-71, under the command of Walter Flachsenberg (October 26, 1908 - November 3, 1994), was one day into its seventh war patrol and 185 miles (300 kilometers) out of its submarine base at La Pallice, France, when it was spotted by W3986/U's crew, commanded by Flight Lieutenant (later Squadron Leader) Samuel Richard Creswick Wood (September 28, 1914 - May 19, 2006) in the Bay of Biscay. Wood ordered eight torpex depth charges dropped on U-71, which damaged the U-Boat as its dived. U-71 was forced to surface, but W3986 was out of depth charges, so Wood ordered the German sub raked with machine gun fire. 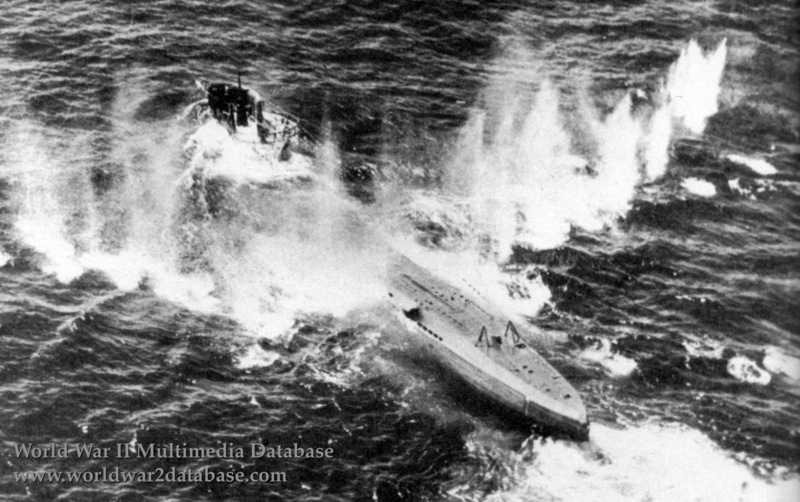 This view was one of a series of action photos taken by Wood's crew, who reported a U-Boat kill. Wood's Sunderland was pursued by a Focke-Wulf FW-200 Condor reconnaissance bomber from I.Staffeln (Squadron) of Kampfgruppe 40 (Battle Group 40), who stood off beyond the range of the Sunderland's Vickers "K" guns and peppered the Sunderland with 20mm (.78 caliber) cannon fire. Two of Wood's crew were reportedly wounded, but the Sunderland returned to base; The Condor also was damaged and reportedly had two wounded. On September 1, 1942 W3986/U also damaged the Italian submarine Reginaldo Guiliano. The Sunderland was lost on May 20, 1943 while flown by Flight Lieutenant Denis Saunders (August 24, 1908 - May 20, 1943). His entire crew of twelve was killed just after take off from RAF Mount Batten. U-71 returned to La Pallice escorted by German E-boats on June 6, 1942; Flachsenberg took U-71 out of La Pallice for his last war patrol on June 11. U-71, a Type VIIc U-Boat, survived the war as a training vessel, only to be scuttled on May 2, 1945 in Wilhelmshaven. Wood received the Distinguished Flying Cross for his war service.